Edilson Almeida, known around the world as Master Eddy Murphy. He started his work in China in 2001, bringing more than 3 decades of experience in the art of Capoeira. He has been officially named by one of the biggest Chinese television networks (Tv Hunnan) as the first and the only Master of Capoeira in all of China, consequentially the first Master of Capoeira to develop the education of Capoeira in Macau. Edilson Almeida was born in 1967, São Paulo city, Brazil. At 11 years old he started to practice Capoeira with one of the biggest Brazilians Masters, master Big Dinho. 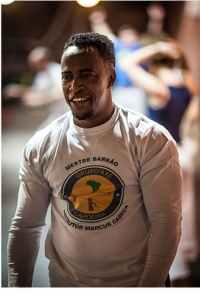 At 22 years old, he graduated teacher and at 32 years old became Capoeira’s Master, one of the most respected masters in the world. In 2001, Master Eddy had joined of Axé Capoeira Group, second most famous Capoeira’s Groups in the world. There are only two masters in this competent and professional team and Master Eddy is one of them. Master Eddy was approved as the first Capoeira Master to join the cast of the Opera Don Quixote in Barcelona with La Fura Del Balls Company. In 2003, he travelled to Hong Kong, where developed for the first time in China, Capoeira classes. In 2005, he started classes in Mainland, China, where he was recognized by Hunnan TV channel as the first master of Capoeira to teach in China. In 2008 was invited to teach Capoeira in a famous Reality TV Show: Americas Next Top Model. In every country he has been always developing a social work teaching adults, children and young people from low-income or special needs. In 2009, he was invited by a biggest Yoga Gym, to develop Capoeira in Macau. Nowadays, Master Eddy has been doing a great job with kids, youth and adults in the region, being also recognized by ICM, MGTO, House of Dancing Water, COD and TDM as the only Master which contributes with such enthusiasm and the only official representative of the whole Brazilian Heritage in Macau. Axe Capoeira Macau started in 2008, where it quickly gathered various supporters of their expressive work within the community of Macau.